I think I fell in love with Elisenlebkuchen, a hearty German gingerbread originally from the city of Nürnberg, when I was a kid. Every year for seven years, I looked forward to my German school’s annual Christmas concert, because I would get an Elisenlebkuchen. When I was living in Switzerland, the Christmas markets gave me the opportunity to eat one of my holiday favourites again. 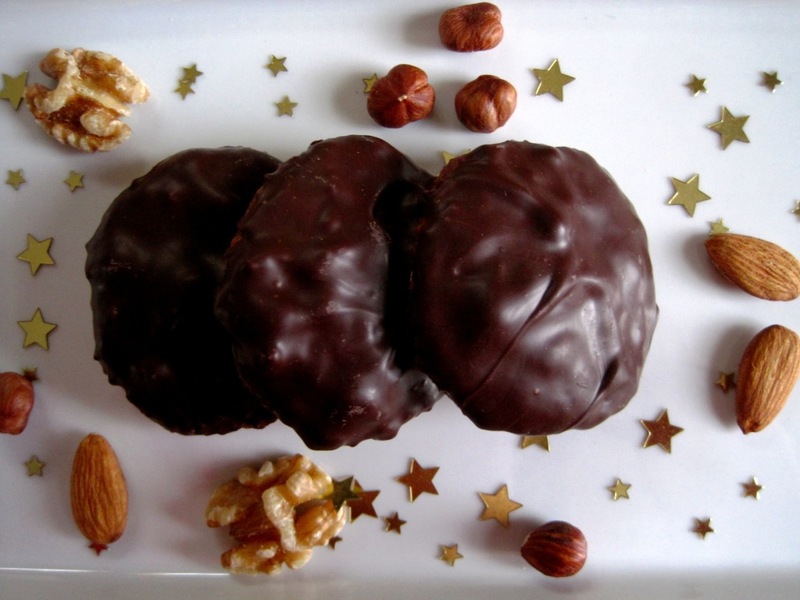 Finally last year, for the first time, I tried a recipe for Elisenlebkuchen I’d tucked away many years ago. I was thrilled to make myself this specialty made of ground nuts, candied citrus peel, and spices, baked on a wafer, then covered in chocolate. 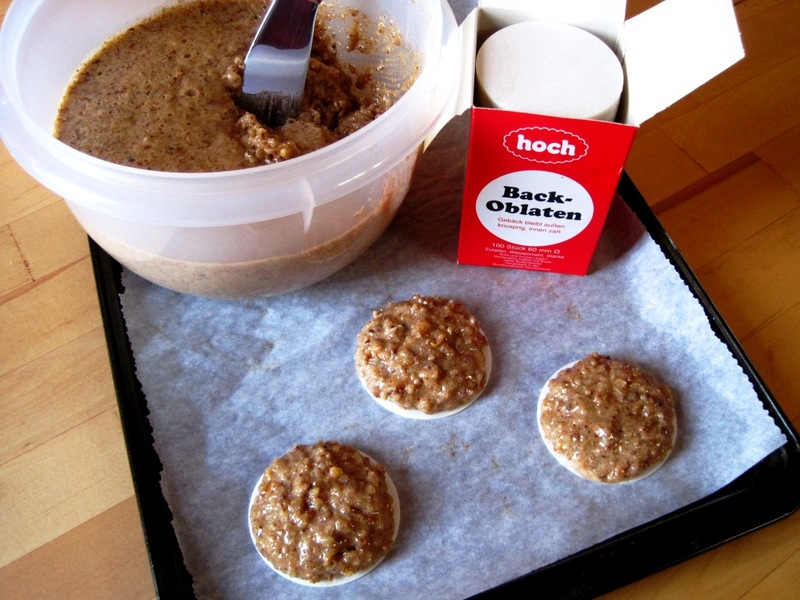 Elisenlebkuchen are now on my holiday must-bake list! Quantities in weight – scale required. The dough must be refrigerated overnight. Yes, the finicky process of tempering chocolate for the coating is worth it! Makes approx 36 6 cm Ø pieces. In a bowl, beat the eggs until light. Add sugar and continue beating until the sugar is dissolved. Mix in spices, lemon zest and lemon juice. Fold in ground nuts and chopped candied citrus peel. Cover the mixture and refrigerate overnight. Preheat oven to 300° F. Line baking sheets with parchment paper. Spread the mixture onto the baking wafers leaving free 2 mm around the edge of the wafer. Place on the prepared baking sheets. Bake 30-35 minutes until lightly browned. Cool. Coat with dark chocolate. I find that David Lebovitz’s instructions for tempering chocolate are the clearest and easiest. What I’ve learned is that chocolate heats very quickly and cools slowly. Next year, I’m going to turn off the heat for my water bath once the water is hot in the hopes that I’ll have better control. Best to use a digital thermometer. Once the chocolate is ready, hold the Elisenlebkuchen upside-down and dunk them into the chocolate. Place them on a wire rack and allow chocolate to harden. An alternative to the chocolate would be to decorate the tops with blanched almonds or other nuts before baking. Cute little wood huts decorated with lights, pine and fir. Snowflakes. Cobblestone streets and old buildings. Voices coming together in festive song. 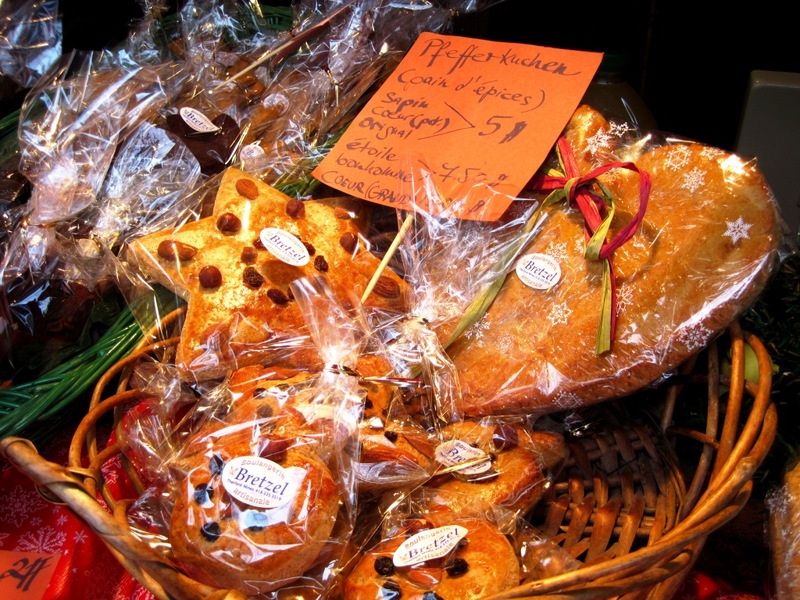 Warm aromas of Glühwein (hot mulled wine) and other traditional specialties. Christmas crafts, handmade gifts and artisan wares. Laughter. Happy people. 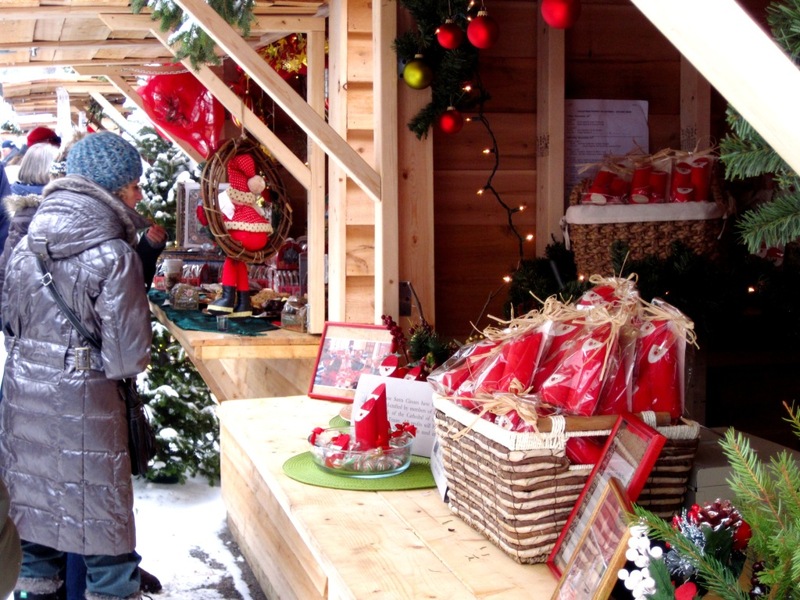 The German Christmas market in Quebec City is the perfect prelude to the holiday season. My long-time friend, Susy, is one of the organizers of this Christmas market. 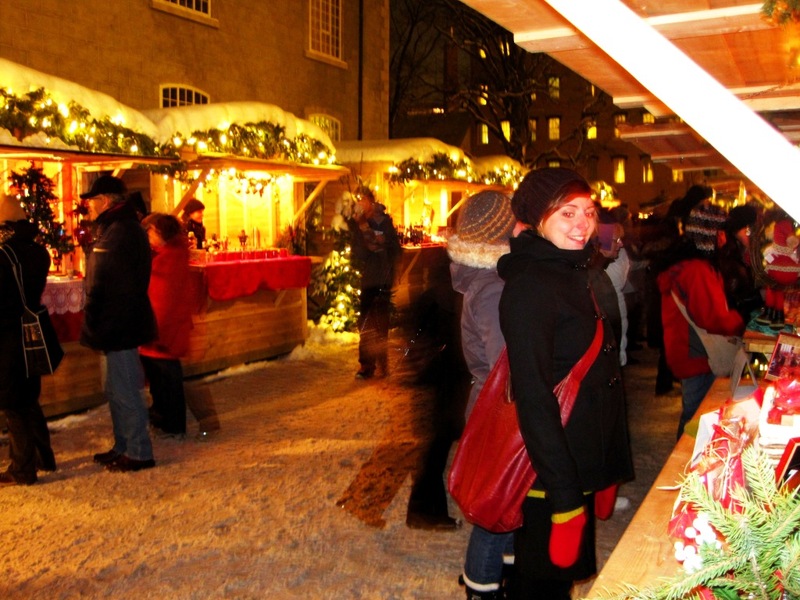 It started three years ago when she and several other Germans and German-Canadians sought to recreate in Quebec City the beautiful Christmas markets common to many central European countries. The first year they attracted over 1000 people to their stands in a community centre (the expectation was 200). Encouraged by this initial success and the apparent interest from the community, they created the Communauté Allemande Québec and started organizing the event for year two. 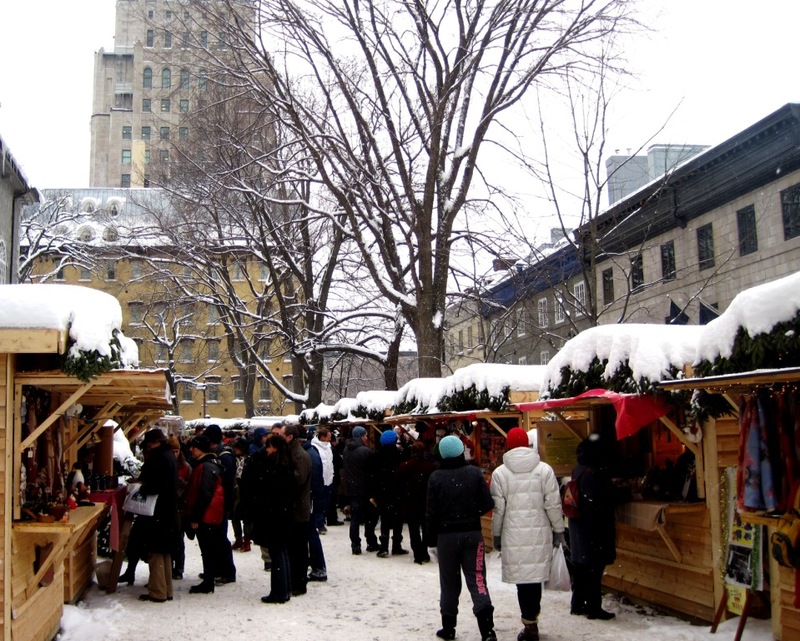 They had wood huts built for the vendors and moved the market to the courtyard of the Cathedral of the Holy Trinity, a beautiful location just across from the Château Frontenac. The second year attracted over 20,000 visitors. This year, the market was extended to two weekends (December 3, 4, 5, and 10, 11, 12). They also increased the number of vendors and added a series of Christmas concerts to the festivities. 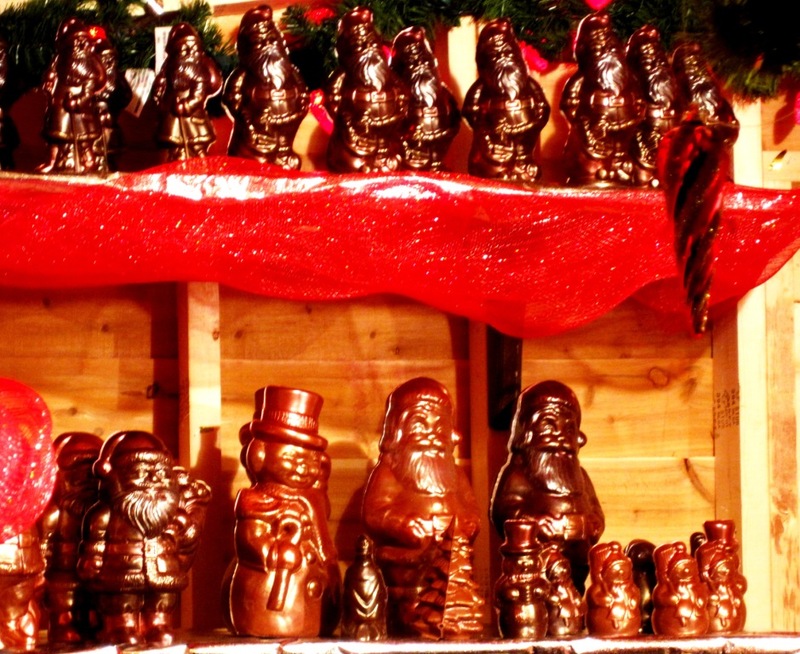 The numbers for year three look promising, proving that the marché de Noël allemand has become a popular event on Quebec City’s Christmas calendar. Needless to say, I’m proud of Susy’s achievements! 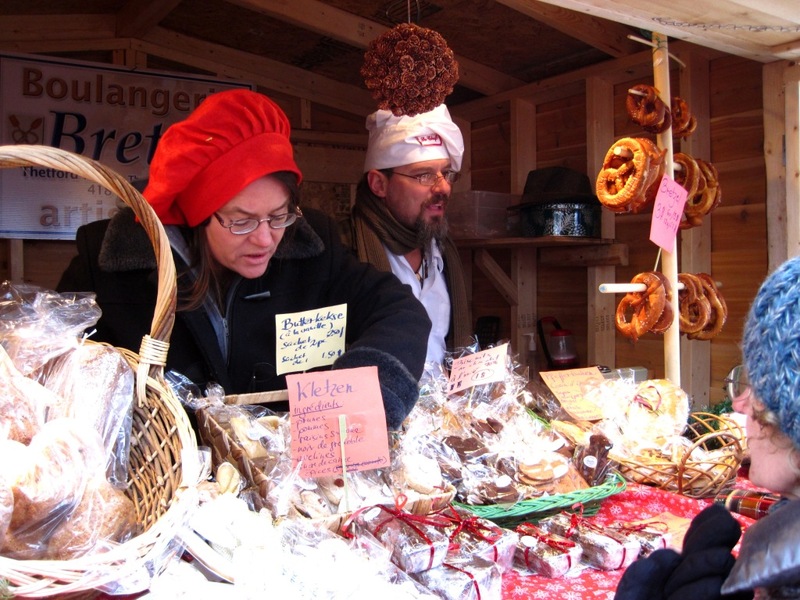 Yummy pretzels and traditional German baking. German gingerbread in pretty shapes and natural decorations. Volunteering at the market allowed me to spend time with Susy, be a part of this great event and soak up the festive ambiance. Of course, I also enjoyed checking out the different foods being offered! In addition to the Glühwein, there were sausages, pretzels, German Christmas cookies, Nürnberger Lebkuchen (German gingerbread), baked apples, roasted chestnuts, crepes, Apfelbrot (a hearty bread with apples, hazelnuts and spices) and Stollen (a candied fruit and nut-filled buttery yeast bread). Yum! 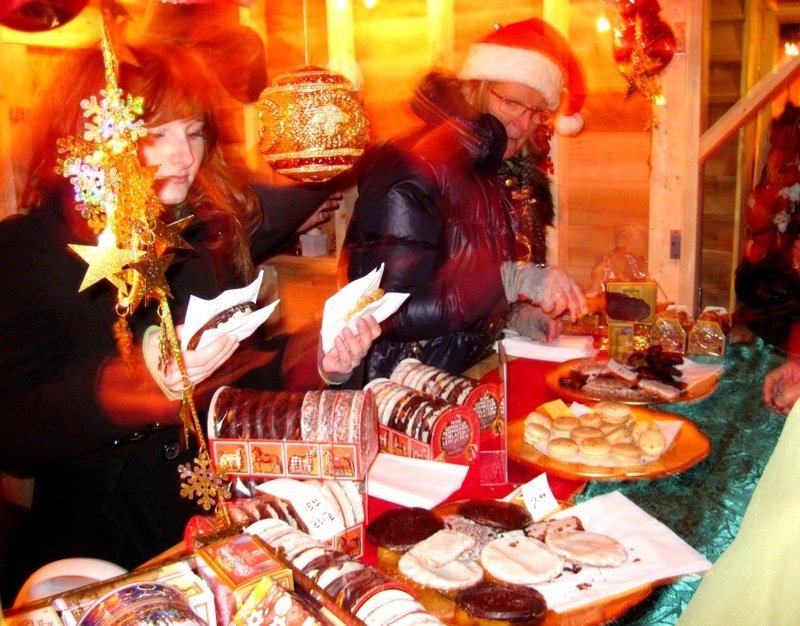 These ladies were busy throughout the day and evening selling Lebkuchen, traditional German gingerbread. 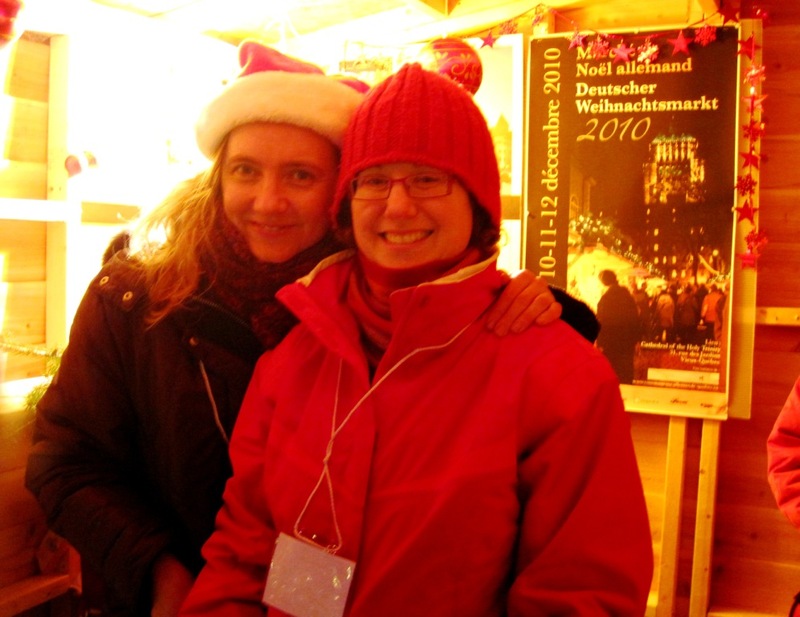 My friend Susy, one of the market's organizers, and me at the German Christmas Market's info booth. 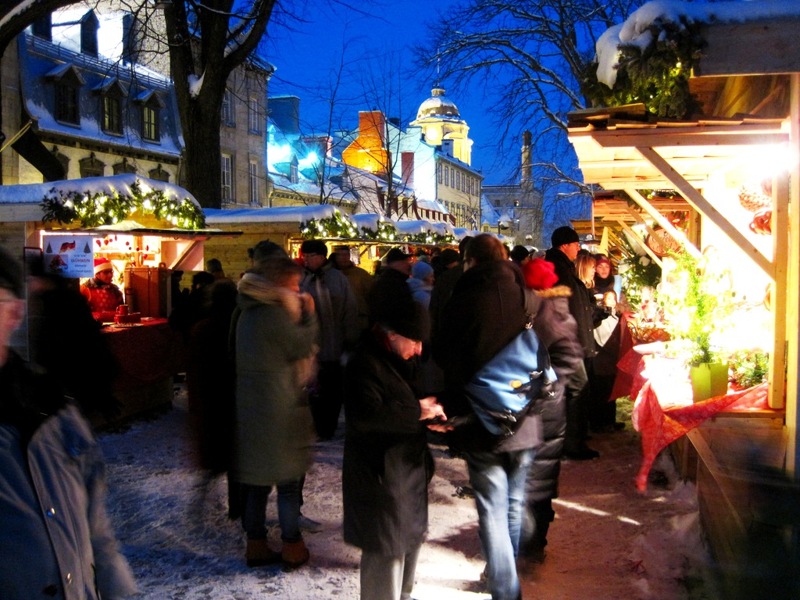 I’ve learned there are European-style Christmas markets in quite a few towns in Quebec. 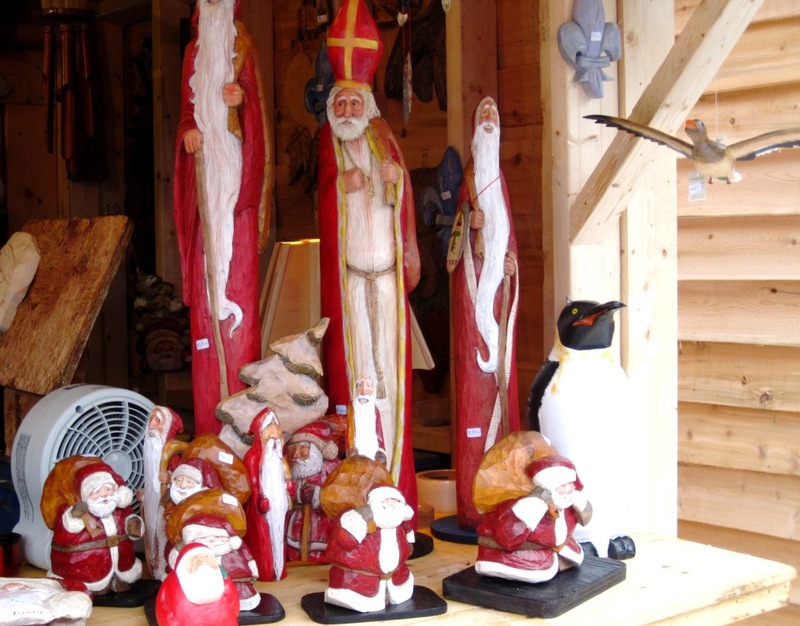 However, the Communauté Allemande Québec‘s German Christmas market is extra special: an incomparable setting in Vieux-Quebec, an authentic German Christmas market atmosphere, and a delightful mix of craft and culture. It reminded me of Christmas markets I’ve visited in Europe. 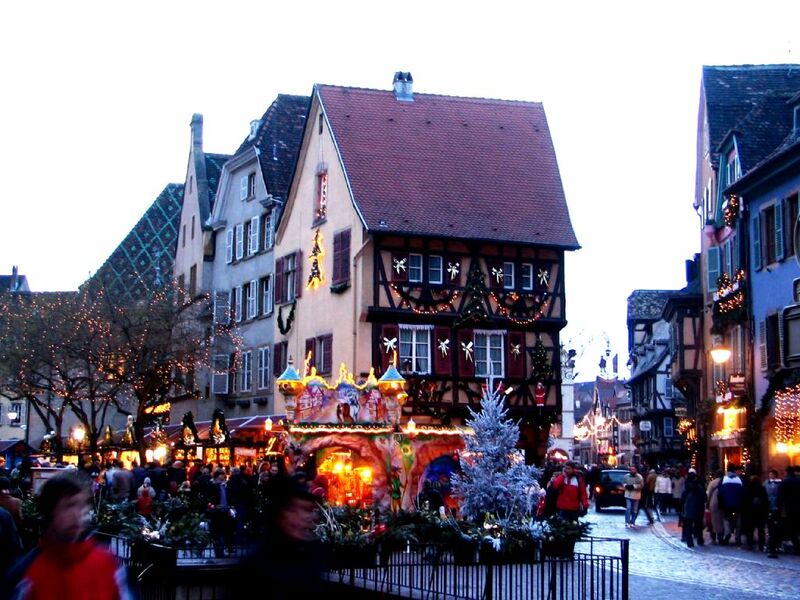 Christmas market in Colmar, France. It takes up the entire city! 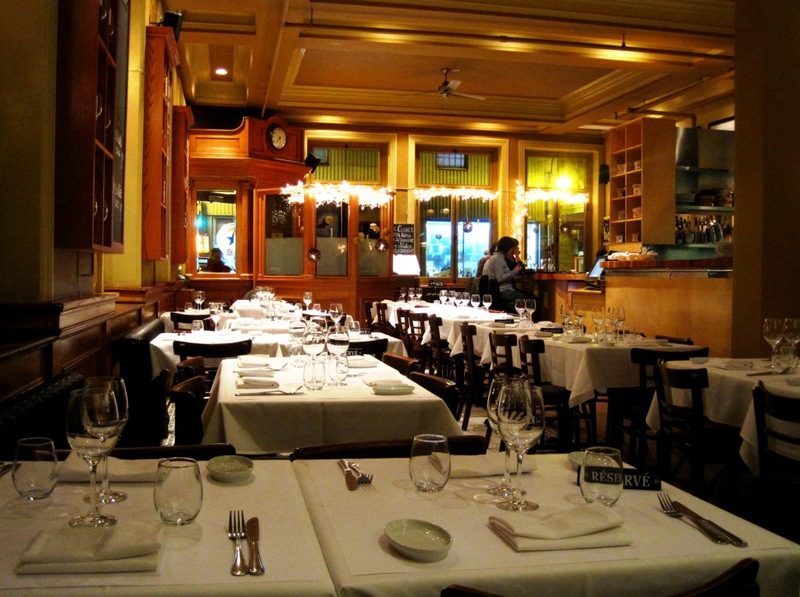 On a different note, I have to add that while we were in Quebec City, we had an exceptional dinner at Le clocher penché, a little bistro in the Saint-Roch neighbourhood. The food was fresh, seasonal, and locally sourced. The service was professional and friendly. The ambiance was charming and upbeat. To start, I had homemade faisselle, a creamy yet light fresh cheese made of cow’s milk just firm enough to keep its shape – out.of.this.world – followed by melt-in-your-mouth pork cooked sous-vide for two days accompanied by a mix of wild rice, squash and bok choy which added tasty texture to the dish. Meanwhile, David had marrow bone as an appetizer, and, as a main course, delicately flavoured boudin noir on a sublime parsnip puree with lightly sauteed apples served with a salad of fennel and apple, a crunchy contrast to the boudin. Delicious! The bar at Le clocher penché. 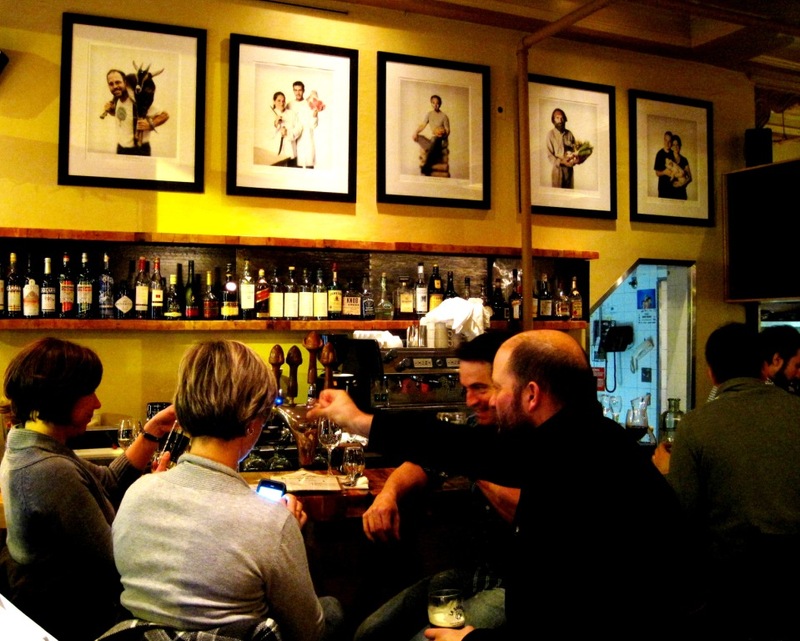 Note the pictures hanging above the bar -- portraits of their local farmer-producer-suppliers.